You would think securing promotion to the top flight of a national league would mean a lucrative bonus for any footballer. 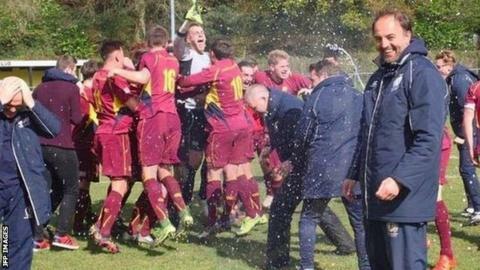 But Cardiff Metropolitan University football team's players have not earned a penny despite securing promotion to the Welsh Premier League. In fact the students, winners of Welsh League Division One, have to pay for the privilege of playing. "They actually have to pay us £150 subscription each season and that's what funds our football budget for the year," director of football and former Wales international Dr Christian Edwards said. "First and foremost they're at the university to study and they have to be good students in order to get their degrees and then it's their football life and their social life. "They really do sacrifice a lot and a lot of these players are in their fifth, sixth year with us. "Charlie Corsby is a PhD student and we've got a few Masters students. These players are not only developing as football players but developing as academics." Cardiff Metropolitan University, then known as UWIC, merged with League of Wales founder members Inter Cardiff in 2000. The students had failed to gain promotion to the Welsh Premier the previous season when they lost out to Haverfordwest County on the final day of the campaign. Edwards said the disappointment of missing out spurred the team on to go one better this season and they secured their place win a 3-0 win at Taffs Well. "We sowed the seed in pre-season discussing about the one goal and we carried that throughout the season," Edwards told BBC Wales Sport. "Barry Town pushed us very hard, Goytre pushed us very hard. We're glad we came out on top." Success on the pitch alone could not have secured promotion to the Welsh Premier League with the University investing in infrastructure and facilities to secure the required FAW domestic licence. Edwards recognises how tough a task his side face in Welsh football's top flight next season but added they were not daunted by the prospect. "We've played a couple of Welsh Premier League teams in the past few seasons in the Welsh Cup and in large parts of those games we've accounted ourselves very well," he said. "We don't think we're going to be ripping up any trees but we certainly think we can compete. "The journey that we started some six years ago is one that is progressive and we always believe we are arriving somewhere rather than arrived." Caerphilly-born Edwards, who started his career at Swansea City, won one cap for Wales against Switzerland in 1996 when he came on as a substitute for current national team boss Chris Coleman. Edwards also played for, among others, Nottingham Forest and Bristol Rovers before retiring from professional football at the age of 30. The central defender spent four seasons with Welsh Premier League side Aberystwyth Town, including a spell as caretaker manager in 2009. A member of the teaching staff of Cardiff Metropolitan University's School of Sport since 2010, he combined his roles as lecturer and director of football with his own academic studies. "It was a natural step when I retired in 2006 to go back to academia," Edwards said. "My wife said I could never retire and become somebody who did DIY. "I was never going to get a job like that so the next thing for me was to study. I always enjoyed studying even when I played. "When I was at Swansea as a youngster I did my A Levels and If I hadn't been fortunate to be a professional football player I think I would have been a PE teacher." Promotion to the Welsh Premier League has not been the only highlight for Edwards this year as in January he was awarded a doctorate by the University. "The intention was a three-year degree and a PGCE and move on but the pathway allowed me to do a Masters degree and then I was fortunate to undertake a PhD," Edwards said. "Another door opened and a job came with it and it's been fantastic. I never set out to gain a Doctorate. "My thesis was based around the culture of the football club so I owe a lot to the football team, the players and the coaching staff in helping me gain my doctorate."